At 9:30am the next morning, our ship, the Pandaw 2, pulls into the river bank next to Yandabo a village famous for making clay pots. 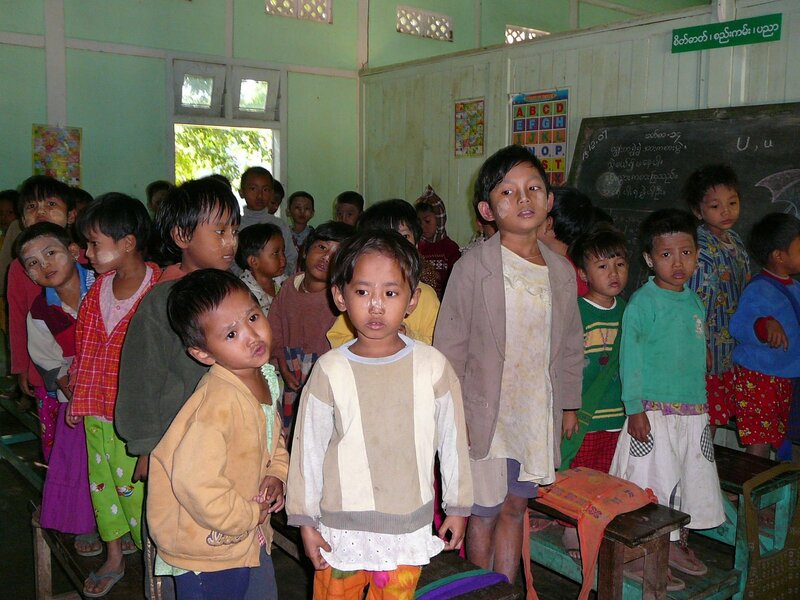 Here the population is 1,100, and apart from a few children playing truant, all the kids are in school. The adults are all busy making the pots, so we are greeted by just a few children and some of the older inhabitants who no longer work. The school has been built with donations from previous passengers on this ship, helped by the shipping company. We visit the school, which is a comparatively modern brick building housing 5 classrooms packed with children. They all learn English. The class of 5 year olds are working on the alphabet and we can see from the blackboard that they have got as far as “U for Umbrella” They are all excited to see us, and when we start taking photos they swarm round us wanting to see their pictures. At the end of our visit, the teachers gather them together and they sing two songs for us. We are told they are singing in English, but while we recognize the tunes, we can’t understand any of the words they are singing! But their huge excited smiles say it all. 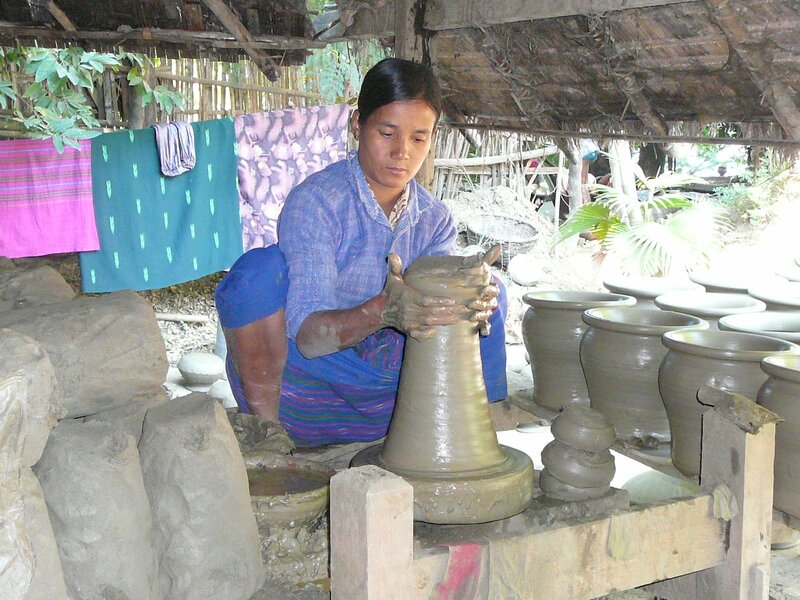 The rest of the village is busy making the pots for which they are famous. We watch as one woman throws pots on a turntable operated by another woman pedaling a belt to operate it. 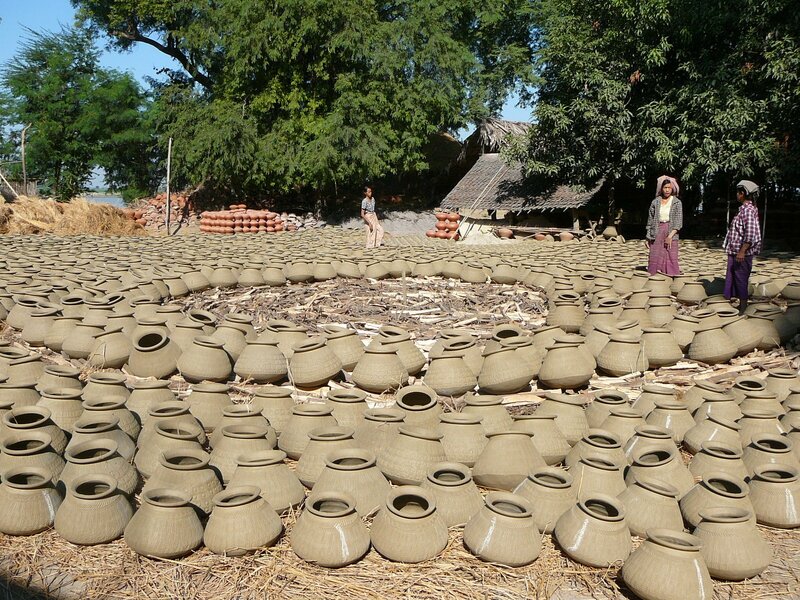 Amazingly, this one woman can make 60 pots a day. We each have a turn at doing the pedaling, and it is so hard that none of us last more than a few minutes. This woman does it from dusk to dawn. 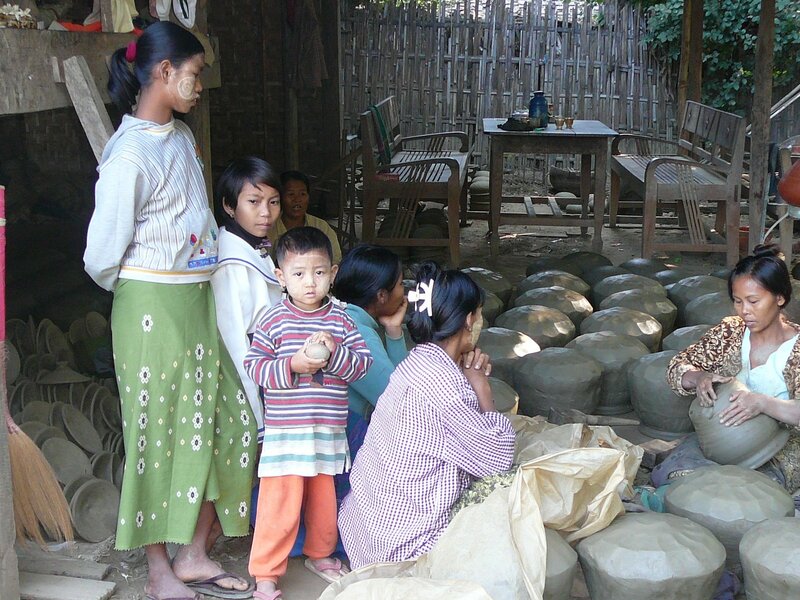 The pots are basic clay pots for cooking and for carrying and holding water. Some are plain and some are decorated. When they have made enough, they arrange hundreds of pots in a field on a bed of straw, around a huge pile of firewood. Then they cover everything with more straw and wood and set the whole thing alight. The pots are finally covered with ash and it operates as a kiln. The fire is kept going for three days and they use everything they can find as fuel, even down to the shells from peanuts that are a basic part of their diet. We arrive just as they are starting to make the fire. 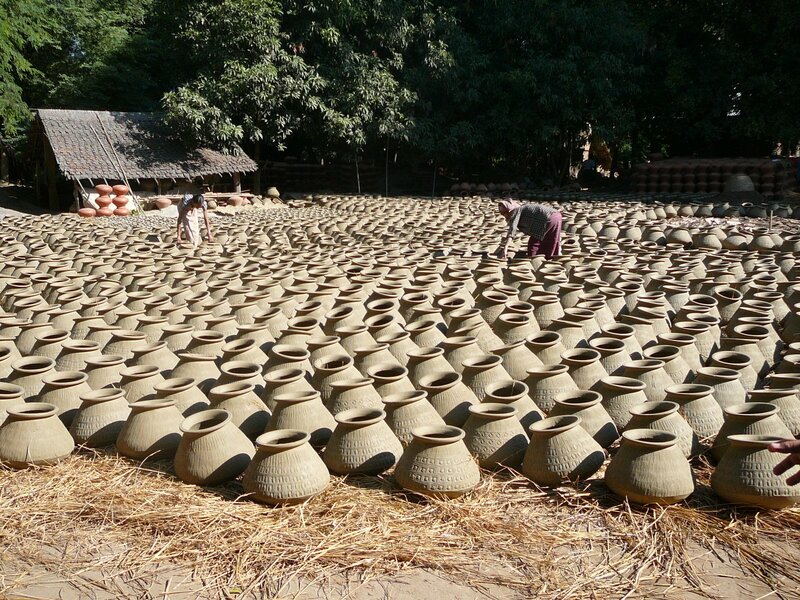 There are over three thousand pots waiting to be fired. It’s amazing that one small village with no tools or machinery can produce this much. The pots are large, unsophisticated but very attractive. They sell them for $2.50 each. It is a bustling village, and seems quite prosperous. 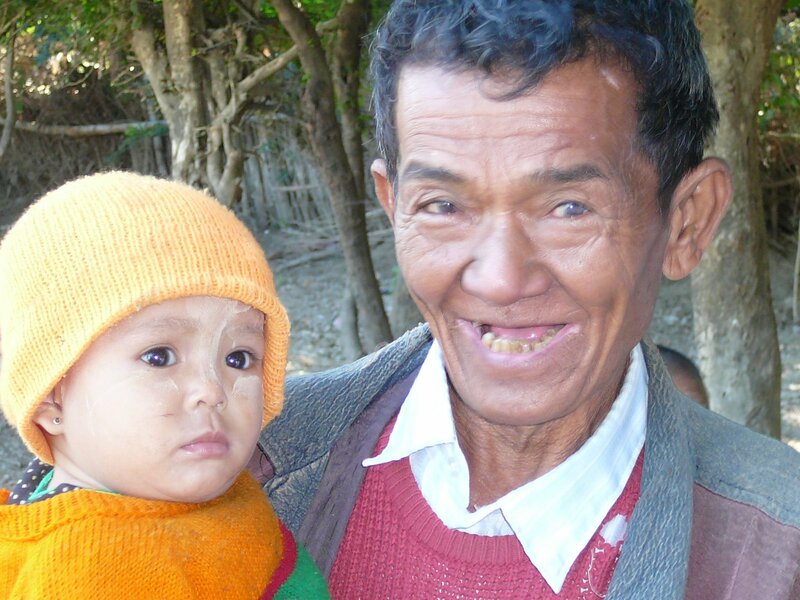 The people are warm and welcoming, as they are in all these villages. I could spend hours watching and interacting with them but we have to move on. 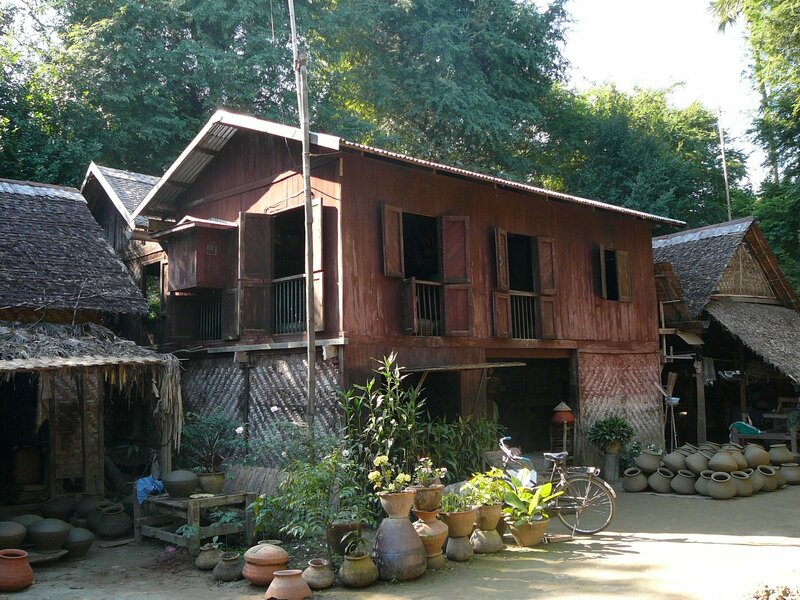 We have learned that the boat we are on also does a 12 day cruise that ventures into the north of Myanmar where there are no roads, and where you visit many more of these riverside villages. We are extremely interested in taking this cruise next year, and so are Derek and Helga. Much to our surprise, they want to make sure we are going before they book. 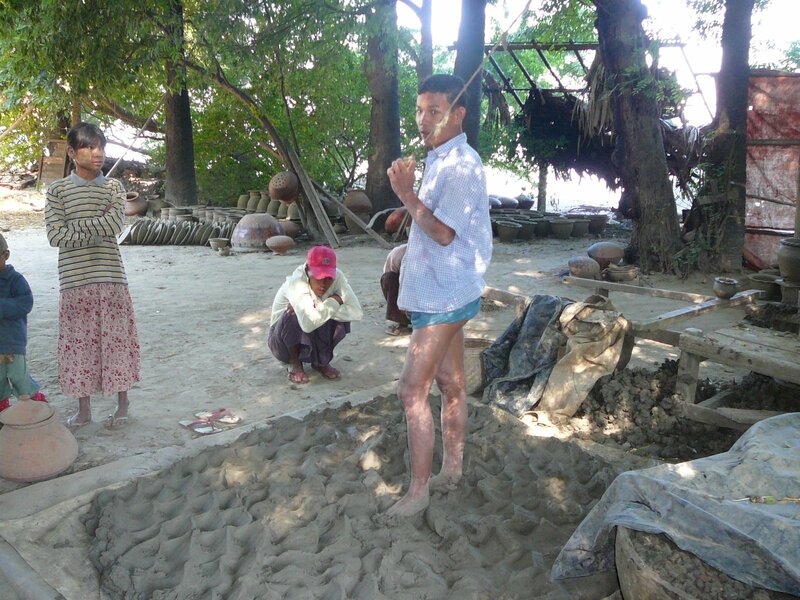 This entry was posted in Burma, Irrawaddy River, local commerce, local residents, Mandalay, Myanmar, The Pandaw 2, travel review, travelogue, village life, Yandabo. Bookmark the permalink.